From the mid-19th century until the 1960s, Maine was the nation’s leading producer of paper, the Detroit of paper production. But unlike Detroit, with its mystique of Henry Ford and the Flint Sit-Down Strike of 1936-37, Maine’s paper industry economic and labor history is largely unknown outside of Maine. Even for Mainers, historians are only now uncovering the vivid story of Maine’s mightiest industry. 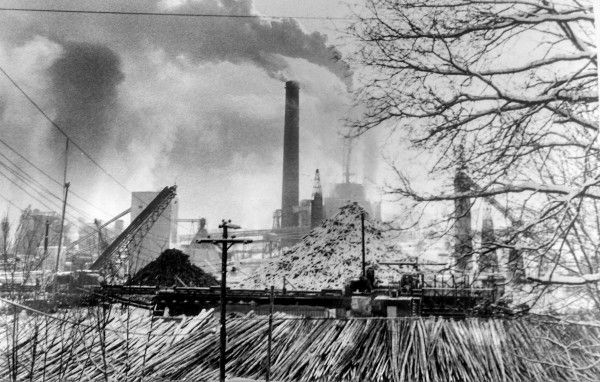 It dominated the state’s economic, social and physical landscape from its inception, building mighty mills on the state’s seven major rivers, and extracting millions of pounds of “pulp” wood from the state’s impressive forests. For many generations, thirty thousand or more worked in the paper mills, and in the harsh winter forests from which raw materials were extracted. Small and big communities emerged around the mills as logging sustained otherwise declining agricultural areas. These industrial communities were tightly knit, and each company and its workers built their own labor relations systems that also included workers’ unions. A historical study of labor and paper mills shows how new technologies were incorporated into the industry and how workers and management were often at logger-heads over work processes, work conditions, and work compensation. In short, a labor history of Maine’s paper mills details the role of technology in Maine society, including its disruptive and transformative effects, and how individuals, workers, and communities resisted, adjusted to, or variously accommodated to the rise and fall of one of Maine’s powerful modernizing industries: paper mills. Stories of Maine’s Paper Plantation (“SMPP”) is an oral and digital history archive that contains formal and informal descriptions and remembrances of life in Maine’s “paper plantation.” The archive comprises 150-plus interviews conducted by Professor Michael Hillard over a fifteen-year period starting from 2000. The interviews are organized into a searchable, index, with each item tagged with relevant metadata including date of interview, name of interviewee, employment location, work history, and other relevant information. Housed in the USM Digital Commons, a flexible, data repository platform, the archive is free and open to the public; citation information for archived data is also listed, to ensure appropriate academic standards when these sources are referenced by users. Listeners have the opportunity to hear the stories of a great diversity of women and men of Maine’s paper industry. You will hear from paper machine tenders, workers from the dark, chemical-ridden pulp mills, women who inspected and counted reams of paper by hand, immediate supervisors and mill managers (a mill’s top position), research engineers, and a diverse group of Maine’s loggers (colloquially known at woodsmen or woodcutters) and the company foresters who supervised them. You will also hear from journalists, politicians, and academic experts, who were connected to the industry as well. This archive tells us about Maine, its peoples, its communities, its work cultures and its histories. It enables us to understand Maine through narratives that are historically contextualized and digitally documented and archived, to ensure that the views, hopes, and dreams of thousands of Mainers and workers continue to find contemporary valence.